The last couple of weeks have passed in a whirlwind of activity. It was all for the good, but still kind of intense. My dad decided to move from his home near Anacortes to a retirement inn located in La Conner, and set a 2-week timeframe to do it. Moving Day was set for May 31. Initially, Rick and I went over with truck and cargo trailer and helped him do a lot of sorting and packing, things he was taking with him and things he wanted to get rid of (he wanted to empty the house). We hauled a load of furniture back to the valley that he would no longer have room for, and that we would love to have. Then we rented a storage locker in Winthrop and moved some of our things there, as this involved a change-out of our living room furniture. 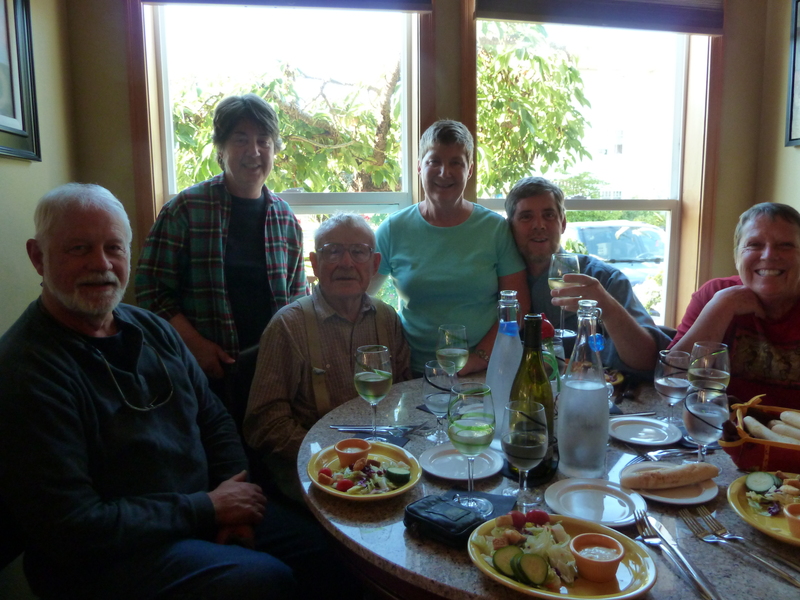 My sister from Colorado, my brother and sister-in-law from Camano, and Rick and I converged on Anacortes on May 30 and we were all there for the big event – Moving Day! Dad had hired a mover but it still took all of us to do the last minute organizing and packing, setting more things aside for Goodwill or equivalent, and then the unpacking at the other end. But it went very well and we got a lot done in just a couple of days. During the week we were at home between Packing Day and Moving Day, I had some appointments and shopping errands to do in Wenatchee (about 100 miles from home, so I try to organize as many things into one trip as possible). On the way home, I passed a vacant lot on the outskirts of Twisp where people put vehicles for sale by owner. There was an Airstream trailer that looked to be in decent shape, so I peeked through the windows and was sufficiently intrigued to tell Rick about it when I got home. Now, I have been saying for years that “some day” I wanted to have an Airstream trailer for when we are able to take longer trips to see more of the USA and Canada. Or maybe take it south for “winter breaks” of a month or two. We have looked at new ones and I have studied the floor plans. But I really knew that we wouldn’t be able to afford one – even used ones at dealerships (10 years old or younger) are pretty spendy. I figured that a bigger trailer than our pop-up camping trailer, with more room and amenities (a bathroom!) would be in our future, but not an Airstream. Anyway, long story made short, we met the sellers that evening and looked it over. It is a 1973 International Overlander (the latter meaning the 27′ long model). It looked pretty good and the price was WAY right. We decided the next morning to go for it (this was the morning we were leaving for Anacortes). It turned out there was another interested party that had made an offer the night before, so we had to counter somewhat, but in the end it was ours and we agreed to meet with them after we got back from Moving Day to close the deal. Sorry, dear family, for springing this on you! It all happened so fast and then we were embroiled in moving. We just put it out of our minds over the weekend. This is going to be a Project that we will work on for a couple of years. 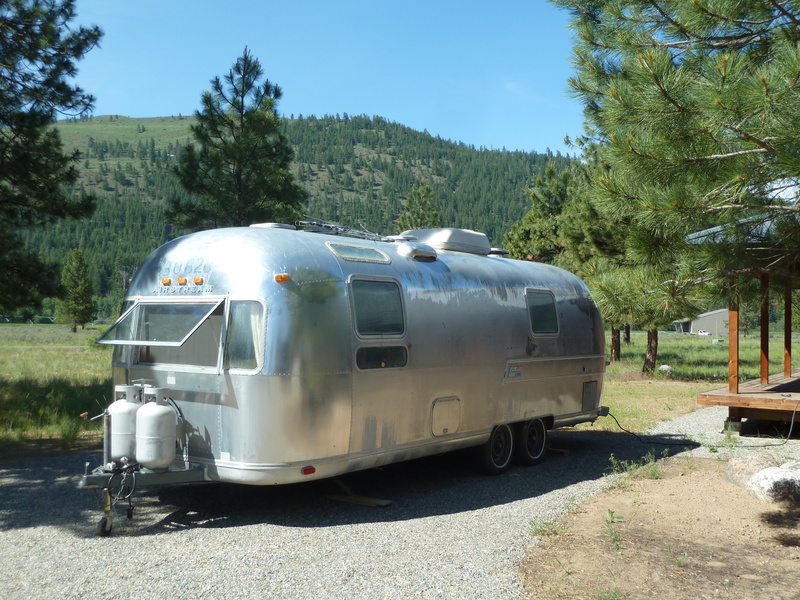 We took it on faith that “everything works” except for the air conditioner, but we are taking it over to Airstream of Spokane at the end of next week for a check-over. The interior is in pretty decent shape, although very 1970’s (can you say “orange formica”?) The carpet is tatty and we will probably put down Marmoleum (old style linoleum) eventually. The windows have a film between the 2 layers of glass that has cracked and glazed, so that will be our major project. We have already found a lot of info on the web about removing and renovating the windows, including new window tint film. In fact, the DIY (Do It Yourself) Channel had a 10-part series a couple of years ago where they completely restored a 1970 Airstream, and they are available online as YouTube videos. At 27′ it is probably the longest model I would have considered (new or old) – a 25′ would have been my ideal – or even a 23′ would have worked. But when you are inside it sure feels comfortable, and there is a ton of storage. So for long trips or staying one place for an extended period, it should be great. 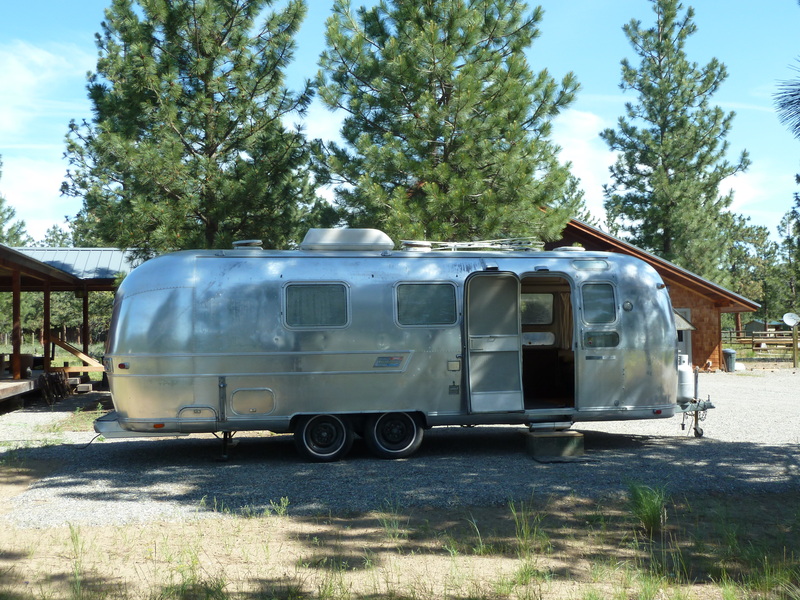 Stay tuned for periodic Airstream postings with before and after pictures! As for the title of this post: we celebrated our 40th wedding anniversary this year – March 17, 1973. This being a 1973 Airstream, I told Rick this must mean the 40th anniversary is the “Aluminum Anniversary”! Holy Smokes! Guess I can stop eye-balling used Airstreams for sale. Sounds like it was meant to be. Glad the move went well and hopefully your Dad is getting to know some of the folks in the new community. Had dinner with Si and Stephanie last Friday. He is taking her off for a surprise birthday trip (she knows they are going on a trip but not where. On the ferry to Seattle to take Stretch to the airport to fly down and visit his Dad. I am a grading fool for one more week.